There are many RV membership clubs and web-based services that you can join for an annual fee - each offering something slightly different. For someone who is boondocking most of the time, is joining any one of them worthwhile? While club rallies and magazines are nice, for us the club needs to have some more measurable advantages. Saving money, after recouping the membership cost, is the key. The biggest cost of RV travel, other than fuel, is camping. Even consummate boondockers like us can't find free camping every night or every place we visit. Aside from Boondockers Welcome, we belong to three other RV membership clubs and are signed up for two other related services. To see which ones, scan to the bottom of the page. How did we choose which clubs to join? Which RV membership clubs will save us real money on camping? If you haven't noticed - we're frugal. We wouldn't join just for the social aspects or the incidental benefits like roadside assistance, which we've got coverage for elsewhere, or a free magazine, which we like but wouldn't necessarily buy. Some years, when we travel to the southwestern states, we hardly ever camp in a campground. But it's harder to find boondocking options in some places than others - for instance, in densely populated areas such as the Eastern United States, Southern Ontario, and anywhere in the vicinity of large cities. When traveling in these areas, we sometimes end end up in more campgrounds than we prefer. With the cost of camping in most of these areas rising to the point of crazyness, a 10% RV membership club discount is just a drop in the bucket. We'd rather spend the night in a parking lot (Walmart or otherwise) than fork over $30.00 a night to sleep in our own bed which is just as comfortable, no matter where it's parked. So, when we do use an RV membership club discount at a campground, we want it to be substantial -50% seems fair. Most of the RV membership clubs have on-line directories you can view. Study the directories for the area you'll be traveling in and you will notice that many of the same parks appear in each and every directory. But the discount may vary...anywhere from 10% to 50%. If you join more than one RV membership club, do your homework, ask for the higher discount, and check to be sure that you get it. There are three that I've found - All have campground directories that you can view on-line before you sign up. By comparing these directories, I found that a large percentage, maybe as much as 75%, of the same campgrounds are listed with each of these clubs. It also stands to reason that the same restrictions will apply as to when the discounts are accepted. Not having to compare those aspects allowed me to compare the clubs a little easier. Most campgrounds won't honour the club discounts during holidays and weekends and some block off entire weeks or months in peak season. You can expect good, well-run parks but not five-star amenities. You may have to drive five or ten miles out of the way and, sometimes, phone ahead for a reservation. However, if saving money is the objective, camping at $12.00 or $15.00 per night sure beats $25.00 or $30.00. If you plan your route and your travel time well, you can certainly benefit from these memberships. Of course, it will also depend on campsites being available but that would apply whether you're a member of a club or not. Chances are you stand a good chance of getting a site on the days (non peak times) when the discounts apply. Camping Benefits: 50% off at 1600 campgrounds across USA and Canada and even a few in Mexico. A referral program, both for campgrounds and campers gets you $10.00 toward your next renewal for everyone who signs up. I like the fact that, even before you join, you can download the entire campground directory, including current prices and discount restrictions, from the web site. So, if you have a trip planned, you can decide before you buy into the club, whether it will let you save money on camping. Annual Cost: $39.99 (multi-year discounts are offered as well). Camping Benefits: 50% off at over 1200 campgrounds across USA and Canada. Download and use your membership immediately. (They claim to be the only one that offers this.) Their referral program is better than Passport America's - you get a whole year free membership for one referral. The downside: less campgrounds in the program (than Passport America) and, although you can access campground listings (USA only, not Canada) online before signing up, the restrictions aren't shown. Annual Cost: For Canadians: CAN$37.99 or CAN$67.99 for 2 years. For USA and international citizens: CAN$60.00 per year. Camping Benifits: 10% dicount at camprounds in directory. (A higher discount up to 25% offered at some). No indication of	how many campgrounds are in the directory but it can be viewed on line before joining. We have belonged to this Canadian-based RV membership club since we purchased our first RV in 1999. Although it has a few other advantages, the main reason we belong is because membership gives us a discount (an amount that is more than the annual fee)	on our RV insurance with Wayfarer Insurance who, after shopping around, has the best rate for insuring our RV that we can find. So really, the membership is free. In fact, it even puts us ahead by $2.00 a year. I like no-brainers like that! Annual Cost: $39.95 with an additional $10.00 administration fee for your first year. Note: Passport America members don't pay this $10.00 so, if you're going to join both, do it in the right order. Membership in this club includes membership in Xscapers, a linked club especially geared to younger RVers, families, and those working on the road. It's voted almost everyone's favorite RV membership club! It offers a minimum of 15% discount and up to 50% off at approximately 1000 campgrounds in the program. (137 listings are at 50% off.) You are sent a directory guide after joining but there's also an online directory showing which campgrounds are in the program and that's available before joining. The club offers some unique benefits and is one of the only clubs that encourages and offers advice for boondocking, but the main reason to join, as far as saving on camping is concerned, is to have access to the 19 five-star RV parks owned or co-operated by the club. These are spread across the mid and lower states. Escapee members can camp with hook-ups in these parks for $10 to $15 per night. Weekly and monthly rates are available with weekly rates at all the parks under $100.00. All of them also offer a dry camping option for $5.00 a night (limited to anywhere between 3 to 21 days depending on the park). Joining would easily pay for itself if you want to spend time in the areas where these parks are located. A list of boondocking sites and cheap campgrounds compiled by SKP members. This directory is only available to Escapee Club members. The online product is called Directory Search and Download and cost is $15/year. A CD of the eBook versions of the Directory is $20. The searchable Directory is online with a superb Route Planning Map where you can plan a route and see the Directory locations along it and, if you are logged in, you can click on them and display the Listings for the city name. Benefits: FMCA offers many benefits for its members including a tire program, roadside assistance for $69/year, access to RV tours, campground discounts, mobile internet service through Verizon and Sprint, savings on RV insurance, and more. Plus, members can save on campground fees, thanks to FMCA's partnerships with Kampgrounds of America (KOA), Passport America, and its network of member campgrounds (most offer a 5 to 10% discount). Members also receive a monthly magazine, Family RVing, in print and digital editions. FMCA also brings its members a sense of community. Members get full access to FMCA’s online sites where they can get RVing advice and how-to tips. FMCA members can join chapters — groups based on common interests — and can attend the club’s biannual International Conventions, complete with educational seminars, games, entertainment, and more! Annual Cost: Membership is cheaper than the other clubs: 1 year $29.00, 2 years for $50.00, and 3 years for $75.00. It's one of the original RV clubs but, truthfully, not what it used to be. And, in my opinion, probably no longer worth joining unless you plan to spend at least $290.00 per year at their stores: Camping World, Gander Outdoors, and Overton’s. You can choose between two different systems at different participating campgrounds: Some offer $10.00 camping (or slightly more) for members, others, a 25% discount. The number of participating campgrounds is limited, with twelve states having no listings at all. Most of the campgrounds have a high ratio of seasonal residents. You can view the directory before joining and restrictions are noted. Annual Cost: Free to join as a host. Hosts earn 3 months of free guest privileges with every guest, or pay $15.00 per year, if they haven't earned the credits. RVers who can't offer a host location (a boondocking spot for fellow members on their property) pay $30.00 per year or $75.00 for a 3-year subscription. Now more than 1600 locations across North America plus a few in other countries, the premise is freindly RVers like yourself who are willing to let you park for FREE for a night or two on their own private property while en route or stopping briefly to explore the area. Providing a location is encouraged but not mandatory. The name implies boondocking but, in fact, many hosts also offer electric, water, and additional services. What a deal! Modelled after similar programs across Europe, membership lets you spend a night parked at more than 700 locations across the USA and Canada - mostly at wineries and specialty farms, (likely to be a country setting). The program's list of participants just keeps growing. An optional plan ($119.00 per year) gives you access to park at 300 golf courses as well. 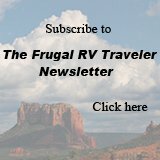 ( frugalrv@frugal-rv-travel.com ) to receive an extra month for free. A subscription to this on-line service for RVers might save you more frustration than money. If you're into "blacktop boondocking", it can keep you from driving out of your way to the nearest Walmart, Flying J, highway rest stop, or Cracker Barrel Restaurant, only to find out all the rules are different here and you won't be allowed to stay overnight. 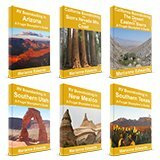 There are other guides on the market for this information, but I like this website because RVers themselves are encouraged (and rewarded by discounts on future renewals) to keep the information up to date. The Benevolent and Protective Order of Elks is, of course, not an RV club but, if you qualify, being a member comes with RV parking benefits. There are 2000 lodges across the USA and many offer free (donation requested) RV overnight parking for members, (actually, we have used it as a non member and no one noticed - just make the donation!) Some lodges even have campgrounds with hook-ups. So, after all this comparing, what RV Membership Clubs did we join? Reasons: They have more campgrounds and are cheaper than the other two 50% off clubs. The directory is downloadable - a pdf document that we store on our computer or kindle and so we don't need an extra printed directory book in our small RV. Reasons: As I mentioned above, for us, a no-brainer. The membership gets us only 10% off at campgrounds which is why I felt we needed the Passport America membership too. Reasons: I joined this one just because I want to know why everyone loves it so much and because, after months on end of boondocking, I like the idea of $5.00 dry camping in 5-star resorts - at least once in a while. Through the club, we also subscribe to the Days End Directory. Reasons: The free wine tastings without having to worry about driving afterwards! Our favorite bottle of wine is bound to cost us less than a campground. We also discovered that most small agri-businesses are run by very friendly people! Reasons: Mainly because the website is a great idea and I want to support it. We don't prefer to stay in parking lots but, like everyone, we do it, in a pinch and usually have no trouble finding a legal option. We have found it quite handy since it also lists which Walmart stores do or do not allow overnight parking. Add it all up and, yes, we are kind of heavily invested in RV membership clubs (just under $200.00 per year) but, you don't have to join them all; why not pick and choose a few and see how often you use them. Aside from the original reason of joining (to check them out), it ensures we can access a variety of free camping options all year long. The same money wouldn't go far in campground fees! We've used all of the clubs we joined, some more than others, but each has been benificial for its own reasons. Of all of them, aside from our own, Boondockers Welcome, Escapees gets my vote as the best for boondockers; the annual fee is reasonable, it offers good value, especially if you use the SKP Parks and Days End Directory. Boondockers Welcome is a place for RVers to connect and exchange invitations to park on their respective private properties. Since it's our own creation, I may be biased and tooting my own horn but it is quickly becoming one of the best-rated RV membership clubs and the best value (with one of the lowest annual fees)!